Here's today's daily open thread on the Neil Young Archives where you can post thoughts and questions. Archives Guy seems to be checking in on occasion as time permits. But if you know the answer to folks' questions, please try and help out, to free up AG to focus on newer issues. Also, see The Neil Young Archives. And -- as always -- see Everything You've Ever Wanted To Know About The Neil Young Archives But Were Afraid To Ask. Just a friendly reminder regarding Archives questions and Archives Guy. Please remember that Archives Guy is a technical production engineer type. He is not in the marketing, customer service, shipping & handling dept. Many issues are completely out of his hands. With that said, feel free to air concerns but try not direct them to AG for resolution. Try and be cool and patient and relax and breathe deep. He is here primarily to handle issues around playback and enjoyment of the Archives. Again, feel free to post here your concerns. But also try and resolve through your distributor. If you ordered from WB site, call 866-430-6230. If still no satisfaction, post issue with your email. AG and his folks have been real good about making things right. Lastly, we know there are tons of positive stories out there. But they're too busy enjoying NYA to post. But let us know if you come up for air something positive & fun! Otherwise, don't let it bring you down, it's only the NYA working out the kinks. Dude, you looked like you almost spilled your beer on the set. careful, man. I am finding that navigating the set is sometimes a VERY slow process. For example, when I select something from the file cabinet, it takes several minutes to load my selection. I have a JVC XV-BP1 blu-ray player. There do not seem to be any firmware updates that I can find (I could be wrong). Did your team test this player? I saw earlier with a guy that had a Sharp player that you were aware of his player's issues through testing with that device. Any help would be appreciated. By the way, you all did a fantastic job with the Archives - truly amazing! Got through the Riverboat disc last night and it's fantastic! Also did part of the 2nd Topanga disc and hearing this stuff in hi-res is great. 1) I notice a lot of folks with issues with the Blu-Ray version of the box... has anyone had any technical trouble navigating with the DVD version? 2) Let's say I have a problem with glue or getting the wrong discs or something, but I bought my box from someone OTHER than WB or Amazon... can I still call that WB customer service number for resolution? Thanks -- can't wait for my box to arrive and be able to join the conversation a bit more!!! have a usual revox b285 amp. with just red/white chinch input. do you recommend just a chinch cable to connect with a low-budget bluray players analog audio output (in my case the samsung bpd1500). or is it necessary for a good sound to use a pre-amp with digital inputs and analog outputs. on the q&a its recommended to check the bluray players audio settings. my manual says that there are no audio settings for the analog output. what a june in europe. waiting for the archives box an looking forward to some shows again!!! i have a complaint about the packaging. first off, does the box REALLY need to be this big? a lot of wasted material here. when i pull out the actual slip box with the blu rays in it it gets stuck on the lip (because it folds in half). the blu rays are shoved in there so tight you have to bang the sucker on the counter to get them to come out. but my real complaint is this. THE BOOK. it smells TERRIBLE, like i can hardly be around it for more than 5 minutes because of the toxic fumes coming off it. i've figured out that it's the faux leather that's causing the toxic smell. has anyone else had this problem? as for the actual archives, i don't know about that. my blu ray player should be hear (sp) today! is there a chance that he will release the 24/196 content for use on a computer-based setup? Then we can use better DAC's than the PS3 is capable of. and this one's up there with the best of them. and there's some good pics and stuff in there too. actually the whole thing is amazing. i watched all the barn clips last night - far out! it's such a brilliant and innovative approach it makes my kness wobbly. who would thought it would happen to us?! I did the dance of joy when I got mine the other day, couldn't believe its finally here! Looks, sounds and is pretty amazing. I thought I would be able to get through it pretty quickly but last night I was only able to skim through a disc and a half in the few hours I had to look through it. Not complaining at all! The EKTIN tracks sound awesome. Stumbled upon an interesting video clip in the archives. The clip shows a conversation between Joel Bernstein and NY about how the audiences have changed over the years, specifically in their response to new material. As a relatively new NY fan (first saw him live in 1996) my frame of reference is rather limited. I certainly have gone to concerts with a wishlist of songs on my mind, but have always left thoroughly satisfied. In fact their have been times where I was upset that there was not more attention given to the newer material. I will never forget seeing him play songs like "Out of Control", "Looking Forward" etc. etc. during his solo acoustic tour of 1999. I was able to make it to all three nights in Chicago, and each night he played a great mixture of old and new. While I did not care for some of the newer songs played on this most recent tour, I had no problem with him playing those songs. Neil has earned the right to play whatever the hell he wants. If you don't like it, don't go to the show. In Neil's words "F_ck the audience." I have a LG BD370. Topanga 2 and North Country works 100%, but I have a problem with Topanga 1, 3 and The Early Years discs. Whenever I try to pick songs from the file cabinet the screen goes blank and i have to pull the players plug. I can play the songs in the play all -option, but lots of the extra stuff is located in the file cabinet, so this is a major problem. Samsung BDP1500, Just wondering how the BR Archives are playing on the Samsung BDP1500, any constructive comments would be appreciated. I have a new Samsung BDP-3600...should I expect ANY tech glitches? I also have an LG BD370 blu ray player and am having the same problems as Endre listed above - please help! This is spoiling my viewing and navigating and I now wonder with these troubles if the DVD set may not have been better. I need help - I bought the set from Amazon Germany and cant send back as would cost me £60 in postage (I'm in the UK) - please please help!! Archives guy - please contact LG and make them make a patch or something!! Dough: I have a Samsung BDP1500. No issues/problems whatsoever - so far. This whole thing is simply amazing and I'm far from finished going through it all yet. Neil Young: so how is everything going on Thrasher's Wheat? Neil Young: but what about the amazing sound quality of the set they paid $300 for? dk, say what you will. i think i got a bum package. my book is seriously toxic smelling...it's outside airing out right now. but i'm not sending it back! My email is gilmourstephen@hotmail.com if you get any news before me. Archives guy please tell me what is wrong on the LG BD370 - this has cost me almost $600 for player and BR set!! Does anyone have a direct email address for the NYA technical support or an email for Archives Guy - i want to have the issue with the BD370 (LG) resolved asap. NO Problems with my DVD version. Waiting here in Belgium on my Archives. When they arrive, I'll need to buy a HDTV and a Blu ray player. When you get updates and new stuff on the net, does it store on the harddisk of the Blu ray player ? Or how does it work ? Do i need to buy an axternal harddisk ? Can anyone explain this (luxury) problem to me? Archives guy - please can you investigate and resolve the problem for me and Endre witrh regards the LG BD370 player - ive spent a fortune on player and blu ray box and hoped this wouldnt happen - it is BD Live with ethernet cable etc but like Endre says there are problems navigating the fils in those discs Topanga 1 and 3, and early years! I do need help ASAP!! Thank you thank you - long may you run! (PS Mine is the European edition) PPS If archives guy is not on today does anyone have a direct email to him - thanks! The look and feel of the archives is awesome. I like all of the old equipment like the tape deck, microphones, the file folders, the notebook pages with the lyrics. Another thing I really like is the presentation of the interviews. When there is an interview, a green sinusoid wave shows when the person is speaking. How did you get that, ProTools? I'm going to use this when I teach sinusoids in Precalculus next year. Great insights from NY on his past. Not a Virgo..but that is funny. "smell the archives on this one.."
personally, I like the way the book smells but know that that scent will mellow over time as the faux leather off-gasses. Sounds like the issue you're having is the same issue I'm having with my JVC blu-ray player. I have only tried Disc 0, so don't know about the other discs you had problems with. I should mention that if I waited long enough (several minutes - 3-4 or so), the item I selected from the file cabinet would eventually appear, but it was inordinately long to wait. I tend to blame the player first, but that's why I asked AG. I should also mention that the same thing happened after viewing some video clips within the menus from individual songs (though with a bit shorter wait time), but NOT when I would look at photos, memorabilia, etc. Made this post on Rust and thought to share it here. I have the dreaded "glue spot" problem to varying degrees on all of the first 5 discs (0 - 4), all others appear to be in pristine condition (5 - 9). I have contacted Archives customer support, as AG suggested at: toll free - 866-430-6230. The customer support rep was extremely friendly and helpful... she stated that a meeting was scheduled for this afternoon and I would be receiving a call when they determined which course of action to take. I really seems to me that they are making every effort to rectify the situation. I have not purchased the PS3 yet (will do ASAP) so the MP3s available at 5:00 PM PDT tonight will carry me through... I sure hope they don't want me to return the entire set... it truly is a feast for the eyes and the book is phenominal! I think the problem with the glue could be solved. Something went wrong at the binder/printer. They probably put the speed of the machine too high. All my sleeves have some marks of glue in the center for about 12 mm. Some of the discs have liitle glue dots. Removing glue from CDs is simple and easy. If a klutz like me can do this, you can too. Get a little isopropyl alcohol (rubbing alcohol) and a non-abrasive cloth. (Toilet paper is okay but do NOT use a paper towel.) Wet the cloth with the alcohol and rub the spot GENTLY, circular motion. In about 30 second the glue will come right off. I did this to the 3 CDs that had a bit of glue. Glue is now gone and they play fine. Maybe we should make an instruction video for this and post it on YouTube or Vimeo. Anyway it's sounds a bit stupid to me to send all the discs back. Solve your problems if you can solve them easy? Nobody has been talking about the smell of the sleeves!!!! It's is really the first time as far as I know that they don't smell anymore. The sleeves are printed with waterink or printed waterless (without water). The printing quality is so supercool and beautiful. This should be the standard for all upcoming NY material! (Please Neil, we want quallity, if you like it or not.) The previous Massey Hall and Fillmore sleeves were still printed with oil based inks. Have a look at the difference. And smell both versions. Oil versus water. Has Neil really gotten as fat as he looks?! Come on Bob. He will practice a work-out at a giant gym in Paris tonight. And after all he is looking good. Thanks again BSM, the glue spots here are the same small, on the non-printed side and looks like a packaging snafu. The Diamondback Rattlesnake fell in love with the book? Wow, that book does smell really attractive. I am thoroughly enjoying the box. Great Job to the team. When the song info screen opens (off the File Cabinet), there is a moment of hesitation after the screen image loads, and the song starts about a second into the track. It's not a big deal, but I'm wondering if there is a setting I should look for, or sit back and let it go (if that is the designed intent). When listening to songs outside the File Cabinet, the track plays from the start...maybe it's a cache issue due to the loading of info? BLURAY, PS3, Yamaha, HDMI user. Get that motherf*cking snake out of the motherf*cking Archives! I also phoned the NYA phone number. They were helpful BUT, know, that it is specifically about disc related issues: glue, damaged sets, etc. or so I was told. My problem is no Archives, nor has the status been changed anytime in the last several weeks. NYA helpline gal (props to you, Julia) gave me a direct # to WBR Customer Service--of which email response has been zip. WBR Customer Service merely re-read the website status with no additional information. In fact, she suggested that stock might be short. there is most likely an answer or update you need. AG has always given warnings about updating your BD Players, it may be that simple of a fix. Give it a shot if you haven't. Bought the DVD version. Three of the 10 discs turned out to be CDs. Will call Reprise now. But first: had anyone else had this problem? EP, I have a PS3 but so far only the Preview Disc. Have not had a single problem thus far. I would most likely go over the actual PS3 Settings to see if there is something there causing the problem. Read over the Set Up on the Archives Disc and see if things on your PS3 fit the bill. There's Video Settings, Audio Setting...etc. which I am sure you are aware of. Hopefully that's where the issue lies. just hoping to be of some sort of help is all. LIVE RUST - yeah thanks man, i have downloaded the one firmware update there which improves dvd playback - however that has made no difference - obviously my blu ray set is a region 2 as is my LG BD370 player - i am not sure if endre is a region 1 - but both have the same problems - oh archive guy where art thou? Archives Guy is busy solving problems with MP3 files. Good to know it's likely a setting. If so, I'll track it down (gone through the PS3 settings once, the Reciever is next). "obviously my blu ray set is a region 2 as is my LG BD370 player - i am not sure if endre is a region 1"
Dude, Blu-ray doesn't have numbered Region encoding. It will either be Region A (US), B (Europe) , or free. SONY.. I'm not sure if I'm a 4%er.... but I had a "few more" Saranacs that in the picture. You don't need beer to enjoy NYA! Right now I'm listening errr... umm... I mean "experiencing" Topanga 3 with a glass of iced tea and a turkey sandwich w/ roasted peppers and Thousand Island dressing. ... and according to the Archives Guy it's region code free. Looks like the team should have left well enough alone and produced only the Bluray, like neil wanted. But you guys wanted all this complicated BS with cd's and dvd's and mp3's. Now look what's happened...you have a real reason to complain. Thanks all - what I meant was my BD370 LG player was Region coded for Europe - just if that helped the AG at all? Ultimately I still have trouble accessing those files as does Endre and Archives Guy - please man get back to me. Get that motherf*cking snake out of the motherf*cking Archives!" Warner doesn't region lock any of their Blu-ray releases, Archives included. Glue/bindery issues, whether 1 isolated case or more, are totally unrelated as to the media packed within. Thanks Thor, I'll be checking it out tonight. "Looks like the team should have left well enough alone and produced only the Bluray, like neil wanted." Would have left lots of people who can't afford to spend $600 in one go out, don't you think? I'm a very happy customer and give kudos to Neil, Archives Guy, Donna (customer service rep) and the record company execs for working so hard to Make it good! Job well done and thanks! I get plenty of bass when playing a regular CD on my new Blu-Ray player and I get nice bass when playing JTTP using the 5.1 choice from the menu. My receiver is a Sony STR-DE997. Thanks and once again great job on Archives! My solution to the “Archives decision” was to buy the CD set, and I have ordered the book and JTTP separately. It’s nice knowing that I can purchase individual CDs or DVDs as gifts too. Eventually I will graduate to the Blu Ray version. (As Neil said, “When I get big, I’m gonna get an electric guitar. When I get real big.” (heh heh) It has helped me a lot; reading these posts is definitely helping the Blu Ray decision. Anyway, I guess I have Thrasher’s Wheat to THANK for the fact that we have a set CD at all, so Thank You Thrasher’s Wheat. And the CDs simply sound GLORIOUS. “I’ve Been Waiting for You”, “Broken Arrow”, the live “Heart of Gold” all sound so gosh darn GLORIOUS. I mean, listening to the guitar, organ and bass on “I’ve Been Waiting for You” just blows my mind, to use an old phrase. As great as all the Beatles and Dylan archival releases have been, yes, the NYA tops them all. >I get plenty of bass when playing a regular CD on my new Blu-Ray player and I get nice bass when playing JTTP using the 5.1 choice from the menu. I think the reason is that the rest of the Archives has pcm 2.0 sound while the JTTP disc has a designated subwoofer track (the 1 in 5.1) On my Yamaha amp the L and R speakers are lid but not the sub and rear speakers. It's stereo, not surround. (Except for JTTP) The reason you have sound in the sub when playing CD's is probably because you have applied a dolby prologic or dts movie/music program on your amp. This will create a 5.1 soundfield (again, the 1 in 5.1 is the sub) However if you play a CD using straight or pure direct mode (the terms differs from amp to amp I suppose) you will get sound only in the left and right speakers (stereo), not in the sub. Really, I'm just saying it's possible it was rushed to accomodate us. I'm not elitist, I'm completist. The Archives - RIP OFF! Neil Young Archives Blu-ray: Rip off? The box is jam-packed with stuff, but is a little short on unreleased musical content. It's pricey. 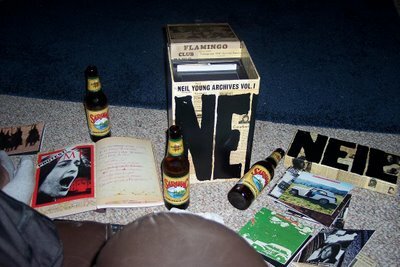 The "Neil Young Archives, Vol. 1: 1963-1972" Blu ray box goes for $349; the DVD is $250; and the CD set a mere $100. The Blu-ray box contains a sprawling 11-disc collection. Young's been working on this set for what feels like decades; was it worth the wait? There's a beautifully bound, embossed-"leather," covered book with tons of cool pictures. Hard-core fans will love it, everyone else will look through it once and be done with it. There's only one unreleased live disc, "Live at the Riverboat 1969." The Blu ray box also includes "Live at Canterbury House" (not a Blu-ray, just a DVD and CD), "Live at the Fillmore East 1970," and "Live at Massey Hall 1971," which have been individually released over the past couple of years. I already bought them, as I'm sure many fans have. What a rip off to make us buy them again. Most discs have music running times of under 60 minutes, so why oh why didn't Neil fill up more of the discs' capacity, or did he just need to justify an exorbitant MSRP? $350 for 11 discs? Strange, Hollywood movies that cost hundreds of millions of dollars to make retail for under 20 bucks a pop, so why does Neil charge $31 for a disc for music he made nearly 40 years ago? Rip off. Archives Guy - are you otherwise known as "Will Mitchell"? Steve Gutenberg? The dweeb from police academy? Nuff said. It's 5pm PST and I'm still working on your precious MP3 files. Do you have any idea how painful it is to the ears to listen to 116 MP3 files back to back to back? OUCH! When we are happy with them, they will be up for you to download. You will be informed. Will Mitchell? No, but that's funny and I'll mention it to him next time we work together. I am SOOO thrilled to have my Blu-Ray Archives set in my house, but since I don't have a Blu-Ray player yet, I was hoping the MP3s would tie me over and that's the only reason I want my "precious MP3s". This coming from a strict vinyl listener and the only reason I got Archives on Blu-Ray is because there wasn't a vinyl option. I can't thank you enough for finally releasing the Archives and can't wait to actually hear the music inside the box!!! I think you better hire an extra person for the phone desk ;). On one of the stickers at the plastic around the box it says 128 audio tracks. The person who wrote that probably thought the hidden tracks were included in the download as well. I know you are stressed out beyond all belief. I found "Emperor of Wyoming" and I found some other "hidden tracks," but I can't find the "hidden version" of "I Wonder" to save my life. I hate MP3, but I am looking forward to it, just so I can hear even a crappy compressed version of the songs I can't find on the DVDs. Let me say, however, that I have listened to everything--some more than once and this only at 24/96--it is amazing and I have already gotten more than my money's worth. I really wish I could afford to upgrade all my equipment and hear the blu-ray version, but I'm not quite that affluent at present. wow. some of you people are CRAZY! i understand being upset if your discs dont play but complaining about the smell and freaking out over MP3s when you bought a HIGH DEF box set is insane! ok, had to vent. i hope everyone with a real problem gets it resolved quickly and cheaply because the box is A TRUE JOY. >I can't find the "hidden version" of "I Wonder"
I have a Sony BDP S550 player and have no issues with the Archives. I have it cabled from the ethernet port to the net port on my wireless router. When I plugged in the memory for the player, turned on the player, everything went smoooooothly and voila, the first BD live download was present on the timeline. Very easy to use by my standards. thanks Archive Guy. Your tips have been invaluable. Thanks Neil, now, let the Horse out of the barn. I think from memory , the MP3 download does not include any of the hidden tracks or bdlive tracks . It only has the original tracks a per the cd set. Looks like they just postponed the MP3s for another day. It is ridiculous: We all paid premium price for high fidelity, but we're all waiting for MP3s. Ordered March 23, from Neil site still waiting. This might be an amusing activity for many of you, but I find it annoying. All I want is to access the music without a lot of horseshit. As I said before, this is great stuff, but it tries my patience to have to futz around with roach clips and feathers & the like. I KNOW what hidden tracks are supposed to be there. i just think the whole idea of hidden tracks is idiotic. I want to hear the music without hours of fruitless clicking. Re: "I'm not elitist, I'm completist." If you were speaking to me, know that I meant meant no personal offense, and in fact my remark was partially joking. I say partially because I really do sense the potential for some class division based on these different editions of NYA1 and what each does and doe not include. Not that I'm seeing any of it here or now-- it just seems POSSIBLE. Also--and you have to understand this from the point of view of someone who is not blu-ray equipped and really, really doesn't feel like waiting any longer than absolutely necessary and so has ordered the DVD set--I think to just do it with blu-ray would have been too exclusive for Shakey's huge fan base. It might have been advantageous to the view, but at the expense of the many. Not that many people are equipped for this new technology, nor want to be right now, especially for the sake of one item (even an item like this), especially when, even if they did buy the machine, their full enjoyment of the NYA1 would be limited to the facility of one machine. So to say the Archives should have been limited to the blu-ray format only, does remind me of the self-serving elite minority of a medieval community who want things done simply so as to advance them, regardless of what would benefit the majority of peasants. It's an extreme example, I know--if you're that poor, you have no business purchasing NYA1 in any format--but I think it's true to some extent. Not that I'm saying everyone who owns a blu-ray set is a selfish tyrant. It's just that it's very easy for a Neil Young fan to be inward-thinking about a release like this, and perfectly understandable. Ahhh, yes, the Archives, an artifact long-suffering fans have been waiting for for an eternity...and now that they're here, what's happening? It's sad, pathetic, though somewhat predictable, that Neil would treat his fans to a Science Experiment. Neil, just give us the music, the unreleased tracks, and let us enjoy this. Do it like Dylan has with the Bootleg Series. It is pathetic - let me say it again, PATHETIC - that Neil has released so little unreleased material while at the same time also re-charging us once again for albums already released (Massey, Fillmore). PATHETIC. Oh, yea, with BluRay Live, Neil will drop archival nuggets into our lap. One problem - we can only listen to these via the BluRay player..and ONLY if our player is connected to the Internet. Say what? What if i want to listen to these on my roof deck, where i don't have an Internet connection? Give me a break Neil! The 96-percenters can justify it all they want, but it reeks of GREED and Impracticality! Hey Dr. Dip - how do you like dem apples? I did rebuy massey and fillmore by getting the bluray set, but like everyone I had the option to only buy individual discs if I thought the box set was a rip off for that reason!!. Roach clips? Man, I found the feathers and then just started looking for them without trying anything else. Looks like I'll have to go back through all the song cards one more time. I took notes of all the stuff I found so far. There sure are a lot of versions of "Birds" on this set. That's not a complaint by any means. Hint: Check out the screen for "Till The Morning Comes"
Not to rub it in but I made my own MP3s (and FLACs) today from the BR set. :) It took long enough but was well worth it for when I don't feel like pulling out the discs. Does anyone know if there's a story behind the design of the books faux leather cover? Yeah, we know mp3s are an inferior sound option but some of us haven't shelled out for a blu-ray player yet, or want to listen to the tracks not sitting at our video game console or TV. Thanks for the help on the questions but really, can you quit your condescending attitude toward people asking about the mp3s? For me it's not over..."
on a side note,the L.A. times says neil young plans to release all his future individual albums in this format. Johnny Rocket is not the only one complaining about the Archives, there are plenty others. Look at the Ratings on Amazon....3 Stars on avg (not 5). Look at the Sales Ranks.....not good, BluRay, last i checked was No. 475 in its category. It's OK if people have a difference of opinion. There are many things to be excited about, but at the same time, many disappointments (the quality control problems, on a set this expensive, are unacceptable). I'm sitting this one out til things get better. I will wait for a free Ripped copy on bit torrent. Over time, i think fans will get tired of listening, exploring this set while watching TV. The appeal will wear off. I have the Neil DVD releases from Massey and Fillmore, and NEVER throw them in the DVD player. I do, however, listen to the CDs or MP3s 96% more of the time. It's just easier and less complicated. "Look at the Ratings on Amazon....3 Stars on avg (not 5)." These ratings on Amazon date from earlier this year! People started rating The Archives on Amazon without any knowledge on how they might sound or look. Could you imagine if Filmore and Massey Hall were NOT in the set? And you had to pay extra to buy the dvd versions. That would kinda annoy me. Well, not really, I'm too happy about the music to be annoyed. But I do wish Canterbury House was in the BlueRay. Ultimately, i will purchase the BluRay version, but given the many headaches long-time fans are enduring right now, i'm gonna patiently sit on the sidelines and wait for improvement before i plunge in. To purchase the set, and upgrade my home theater system, i'm looking at a $1500 spend, and i just can't afford to make a mistake of this magnitude. BTW, i saw you in concert recently, and you were well worth the price of admission!!! Johnnie Rocket knows the deal. Hey Rotten Johnnie Rocket, which remastered songs from the Archives did you buy on Amazon? I havent purchased any of the remastered songs on Amazon. "Over time, i think fans will get tired of listening, exploring this set while watching TV. I never listen to the CD's - only the DVD's for the sound quality. The only thing I used the CD's for is ripping to MP3. Especially on Massey Hall the differece in sound quality is noticeable even after an evening of beer and tequila. For those of you complaining about MP3s, why didn't you (or why don't you) just buy the CD set? You obviously do not care about sound quality but frankly the CDs sound fantastic, and you can easily make your MP3s from your CDs. And the CD set is less than $70 at Amazon. Why didn't i buy the CD set? i'll tell ya - there is not enough unreleased material on the CDs to justify the purchase. I currently own a good deal that's on there (wow, how nice would it be to have duplicate MP3 copies of Massey and Fillmore) - there's a smattering of true unreleased material that i would love to have. My guess is that Neil will release a lot of great unreleased material as part of BluRay live....but the problem there is the only way you can listen to it is if your BluRay player is connected to a live internet connection. Try taking those songs with you when you travel....not gonna happen. Hopefully in the future Neil will package up all the unreleased material, in one package, then i'd buy that. the reviews like it is a forum. Amazon provides a forum also but many people don't use it and write general comments under the reviews section instead. There are some people on Amazon unhappy with the sets. There are multiple one-star reviews from folks who presumably own it. I've never seen a boxed set debated this fervently. I was expecting unanimous 5-star reviews, but apparently that is hardly the case. Some folks have deep dissatisfaction with this offering. Can't say i blame em....for having an opinion, that is. My car wouldn't start this morning - f*^king box set!!!!!!! Archives was finally released in stores in Ireland today. don't know how it sounds as none of the computers in work play DVDs but the set looks brilliant and smells... interesting. and what a pleasant surprise to find sugar mountain in there too. looking forward to as great weekend now, after i vote. I have had the set on blu since Tuesday and is indeed amazing. Other than turning it off to watch the excellent PBS documentary the other night, the archives have been my only viewing/listening (other than some recent shows while at work). True, the packaging is both cool and a nightmare. The blu holder does get stuck, and the box with the mp3 card actually seems like it isn't supposed to move. Luckily, I read that there was something in there. I have been playing it on my PS3 and have not yet had any problems. I have 7.1 system, but listen to it through good headphones (not earbuds) to try to get the purest sound. It is warm and wonderful. I'm glad he went with PCM instead of either Dolby HD or DTS, which impose a "sound" on the music (listen to the Shine a Light blu-ray and switch between and you will hear that the DTS is much more bass heavy. My 14 year old twins have been sitting with me, and they are amazed with the music, sure, but also with the depth and interactivity of the set. Oh, I tried the set on a computer with a blu-ray drive, and Power DVD doesn't work at all. I downloaded the recommended Arc Soft Total Media trial, and it works pretty well, and quickly. But you really need a pretty powerful computer with a dedicated graphics card to handle the load. I wish the screens were mouse accessible, instead of having to use the virtual remote, but that is a small thing. One question. Given Neil's admirable dedication to sound quality, why are the downloads limited to mp3s, instead of allowing FLAC downloads with CD quality sound? Frankly, if people want to steal the music, that will be possible, so why limit the quality for those of us who want to take the music on the go? No real complaints from me otherwise. I love the set and am very grateful to Neil for his work and dedication. On suggestion: could you get together with the Dead people and share the technology? Give them some pointers? Like Neil, everything has been saved, and they would be a great band to receive what will always be known as the "Neil" treatment from here on in. I love this box set and don't have one single complaint! I love all of the detail and appreciate all of the blood and sweat that it took Neil over 40 years to create this massive work. Everyone that I've showed can't believe how unbelievable amazing this thing is. I really don't understand why so many are upset. Don't buy it then. Who's forcing you to? If you like the songs included and are an audiophile that thinks hearing the original release of "Old Man" as if you were in the recording booth in Nashville is worth all of the money, then buy it. And if you want to hear an alternate mix of "I've Been Waiting for You" or a new version of "Dance, Dance, Dance" or "Bad Fog of Loneliness" - then buy it. If its not worth your money, then don't buy it. So you know, I don't have a steady job and am just barely getting by. In order to afford this $300 set and a Playstaytion 3 from Craigslist to watch it, I sold things. Clothes. Lots of clothes on eBay. I'm not a rich kid. But if you love music, and specifically Neil Young, then you'll figure out a way to get what you want. Just because you don't have the $600 bucks to get a PS3 and Achives on Blu-Ray, doesn't mean its not worth it. Thank you for hearing me Archives Guy, Thrasher and Neil Young. Now find that old guitar you don't play or some old shoes you don't wear and sell em on eBay. People want your junk and you want The Archives on Blu-Ray. take it home. If NY's camp considers it a throwaway, they shouldn't be advertising it to entice buyers. It's been a great couple days of listening to Archives. I'm happy with it. However, I don't get why there's so much secrecy with the BD-Live downloads. I understand about keeping future downloads under wraps but I'm more concerned about the one that's already out there. I downloaded the first one but I had to go digging around to find out what it was and where to find it. After searching around for awhile, I finally found the blue push pin on the timeline, but I thought it was just the "I Wonder" hidden track and not the bd-live download. Are there directions for the bd-live stuff (how to find or a FAQ) somewhere I'm not seeing? Had I known I was looking for blue push pins on the timeline I could have saved myself alot of time and frustration. I get the whole digging around/experience thing, but this shouldn't be a test to see if I recognize any changes after each new download. Hopefully I just missed a tutorial or explaination somewhere. Hey, just wanted to write and say how much I am enjoying the Archives Vol. 1. I got the Blu-Ray version and while I have seen some glitches, they have been minor and I expect they'll be fixed when Sony releases a new patch to their PS3 firmware. I love the attention to detail, particularly the view that you get of seeing the record being played or the reel to reel player's tape moving over the tape heads and going onto the other reel. It would have been easy to skimp and run a loop of video, but that isn't the case. The audio is fantastic. It fills my living room with sound. I can't wait for Archives II. Just give us some time to save up some money! Another happy Irish customer here. Picked up my DVD set in HMV this morning. I had reserved one, called in to confirm the reserve the following day to find there was no record of it, and reserved it again, so I was half expecting further delays or a box of mixed glue-covered cds and bluray discs! Luckily everything was present and correct. So far have gotten through Topanga 2, disc 0 and Topanga 3 in that order - sacrilege for some perhaps. The remasters are jaw-droppingly good, and some of the extras are really amazing. The book is great too. I'll have more to say after I delve further into the set. My only gripe (well apart from the bizarre omissions!) is the packaging - looks great and is well designed in theory but EVERYTHING is stuffed in too tight. The "stash drawer" wouln't come out, after pulling at it the top panel came off (luckily it stuck back on) & it took me about 10 solid minutes to get it out using a butter knife, gravity and prayer. The book is very hard to get out after it has been unwrapped, and you have to beat on the disc holder to get the discs out.... but we already know this. Given the large box (which I like) there's no reason for such hardship. Having already coducted some failed experiments with string, I'm going to get some black paper and make little custom handles for the book and drawer. And I don't care if the MP3s aren't available til 2010. The music sounds amazing and I'm so happy to be finally able to immerse myself in this unparallelled set. Well done to all involved. "Quality, whether you want it or not"
* even if it's just MP3 quality. What is particularly striking to me with the Blu-ray audio is how much it sounds like reel-to-reel. It is perhaps the "warmest' tonality I have heard from a digital source. The ability to check out the related material while the songs are playing is a great demonstration of the interactivity of Blu-ray technology. The immersion effect is very effective. I got the local music store (www.millvalleymusic.com)guy to reserve me a DVD copy of the archives, and it has been BLISS since I opened the package. I've only gone through the first 5 discs as of yet (I'm lovingly pouring over all of their treasures) but look forward to the rest of the set. As for the MOP#s, yeah.. I'm bummed that they aren't available as of yet, but I can wait. But PLEASE, don't make me wait ANOTHER 20 years for 'em! Saturday morning, June 6, still waiting for the mp3 download link...I don't understand.